A network of fused-silica single-mode optical fibers forms the backbone of the worldwide communication infrastructure. The maximum rate of transmission of information over such fibers has increased by four orders of magnitude over the last three decades. A question naturally arises : is there a fundamental limit to the maximum achievable transmission rate, or capacity, of single-mode fibers ? 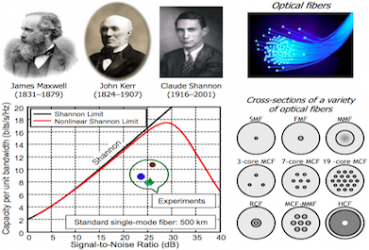 After a brief historical perspective on guided-wave transmission and a review of Shannon’s information theory, the optical Kerr effect that characterizes the nonlinear behaviors observed in optical fibers will be discussed. It will be followed by a description of the ‘optical fiber channel’ pertinent to optical networks and of strategies devised to maximize the transmission of information over fibers, including the use of temporal solitons and nonlinear propagation reversal. Results of calculations of the nonlinear Shannon capacity limit will be presented and it will be shown that we have now reached 50% of this capacity limit in record experimental demonstrations. The consequences for the internet backbone of being so close to the nonlinear Shannon capacity limit will be outlined. The use of multicore, multimode and photonic bandgap fibers as a way to increase the capacity per fiber strand beyond the nonlinear Shannon capacity limit of single-mode fibers will be presented. Finally, the nonlinear propagation equations in fibers supporting multiple spatial modes will be introduced and the richness of doing nonlinear optics in such fibers will be highlighted.